EVERY Second Saturday of the month in 2018 is FREE! Come explore all of the NEW exhibits at the Oklahoma Hall of Fame and Gaylord-Pickens Museum for FREE on the second Saturday of each month! NEW Makerspace – A permanent installation by Oklahoma City artist Kris Kanaly will be featured in the remodeled Makerspace on the second floor of the Gaylord-Pickens Museum. This amazing artist has created a bright and intricate work that represents all of Oklahoma and the images that unite us. The Makerspace also features new STEAM activities and hands-on creativity exercises. NEW Picture Yourself! – The third installment of the immensely popular Picture Yourself exhibit will feature interactive displays that highlight In the Cockpit, Energy and Superstar Spotlight. 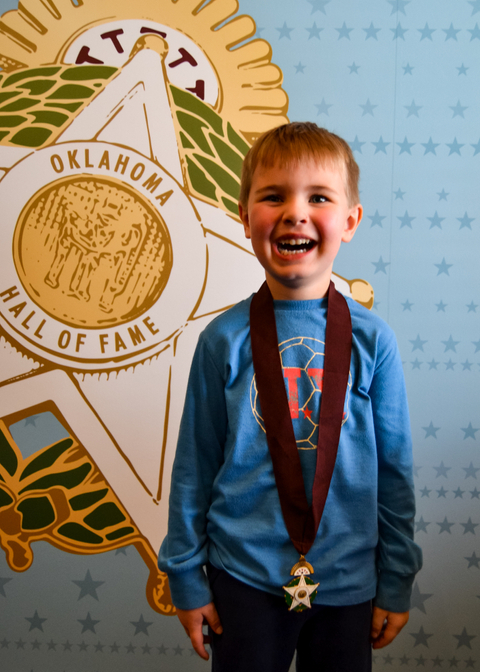 In Picture Yourself, you step inside the gilded frames of Members of the Oklahoma Hall of Fame and create your own viewpoint of being a proud Oklahoman. NEW Reveel.it Portrait Exploration – Using your smartphone, you now will have a chance to explore the biographies, photos, videos, and books of every Hall of Fame portrait in the building. This URL-based technology allows you to learn more about Members of the Oklahoma Hall of Fame and dig deeper into the fascinating stories of these inspirational Oklahomans. Saturday Hours are 10:00 a.m. to 5:00 p.m., make a plan to visit!